At night fall, the iconic Maryland State House dome in Annapolis makes an interesting location to show a technique called motion blur. Do you see how the cars are speeding by me toward the state capitol? You do because of the long streaks of red tail lights. Without those streaks, the cars would look very static, almost parked. 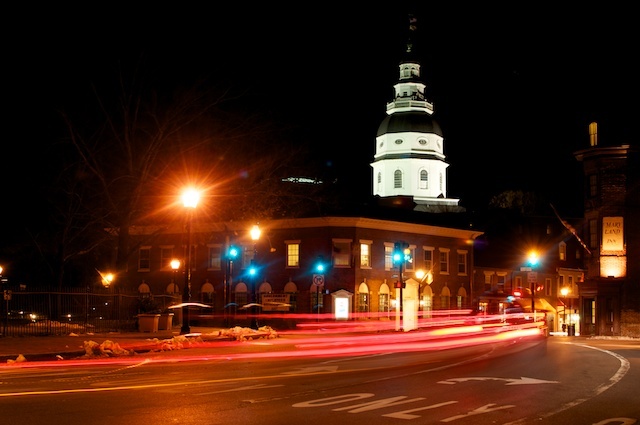 Streaking red tail lights create motion blur at The Maryland State House in Annapolis. Motion blur is a technique used to show your viewer that your subject is moving. Create motion blur my manipulating how slowly your shutter opens and closes. When you take a photo, anything that moves while the shutter is open looks like a blur or a smear. The elements that do not move remain sharply in focus. Use longer shutter speeds to create the blurring effect. The speed your subject is moving. A segway rider won't show the same blur as a NASCAR racecar at full speed. Naturally the faster your subject moves, the more dramatic the blur you can create. The direction your subject is moving. If your subject is moving across the frame, the motion will be different than if the subject is moving toward or away from you. The focal length of your lens. The more you zoom in, the more sensitive your camera will be to motion or movement. The amount of available light. It's easier to make dramatic motion blur shots in low light scenarios. Slow shutter speeds in the height of the day can lead to overexposed images. Use a lower ISO. An ISO rating between 100 to 200 will force longer shutter speeds. Shoot in shutter priority mode. Using the "S" mode on Nikons or "Tv" mode on Canons will allow you to directly control and slow down your camera shutter. Steady yourself. The slow shutter speed that shows motion can also potentially create camera shake. Steady yourself for the slower speeds. Use a tripod. For best results at very slow shutter speeds, you might need to use a tripod to keep the camera absolutely steady. Create an image where you use motion blur to communicate that your subject is moving. It doesn't have to be a night shot, just any image where we clearly see motion or movement. Once you have a great hero photo, post it in the comments here or tag it #composition21 when you post it on Twitter or Flickr.